Alert #2 On Hurricane Irma Issued By The Bahamas Department Of Meteorology Tuesday 5th September, 2017 At 9am Edt. A Hurricane Alert Is Now In Effect For The Islands Of The Southeast Bahamas And The Turks And Caicos Islands. This Includes The Islands Of Inagua, Acklins, Crooked Islands, Mayaguana, Long Cay, Samana Cay, Ragged Islands And The Turks And Caicos Islands. A Hurricane Alert Means That Hurricane Conditions Are Expected In The Mentioned Islands Within 60 Hours. At 8am Edt, The Distinct Eye Center Of Hurricane Irma Was Located Near Latitude 16.7 Degrees North And Longitude 57.7 Degrees West Or About 270 Miles East Of The Leeward Islands, 966 Miles Southeast Of The Turks And Caicos Islands, 1072 Southeast Of Matthew Town Inagua And 1388 Miles Southeast Of New Providence. Reports From Hurricane Hunter Aircraft Indicate That Irma Continues To Strengthen And Maximum Sustained Winds Have Increased To Near 175 Miles Per Hour With Higher Gusts. Irma Is An Extremely Dangerous Category 5 Hurricane On The Saffir-simpson Hurricane Wind Scale. 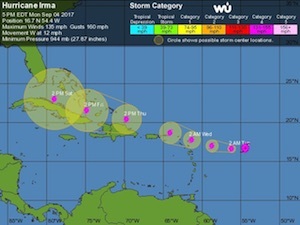 Some Fluctuations In Intensity Are Likely During The Next Day Or Two, But Irma Is Forecast To Remain A Powerful Category 4 Or 5 Hurricane During The Next Couple Of Days. Hurricane Force Winds Extend Outward Up To 45 Miles From The Center And Tropical Storm Force Winds Extend Outward Up To 140 Miles From The Center. Residents In Inagua, Acklins, Crooked Islands, Mayaguana, Long Cay, Samana Cay, Ragged Islands And The Turks And Caicos Islands Should Ensure That All Hurricane Preparation Are Put In Place As They Can Begin To Experience The Effects Of Hurricane Irma By Thursday Afternoon. Residents Throughout The Remainder Of The Bahamas Are Advised To Seriously Begin Making Preparation For Hurricane Irma. Small Craft Operators Throughout The Bahamas Should Begin To Seek Safe Harbour For Their Vessels And Make Sure They Are Properly Secured. The Next Alert On Hurricane Irma Will Be Issued At Noon Today.